I have been not so happy with the vegetable stock recipe that I have used for the past couple of years. I wanted something that had more depth and was richer in flavor. After rethinking my stock situation, I headed to the market. I loaded up on lots of fresh veggies and got to work. I am really happy with how this recipe for Homemade Roasted Vegetable Stock came out. It is loaded with flavor as well as all the goodness that comes with vegetables. I took the same approach as I do with my chicken and beef stocks, I roasted the veggies until they were a golden caramel color. Then I added water and let them cook low and slow. There was just enough water left on the veggies, from washing, to keep them moist during the roasting process. I did not use any oil or salt in this particular recipe as I was going to be making a big pot of detox soup and one of the things about detox, is eliminating some of the good. As well there was no need to let the recipe cool for a long period before using, in order to skim off any fat; there was none. I did want the finished stock to be a bit richer, so I blended a few of the cooked carrots with about a cup of the stock and then added it back to the pot before using – the end result was a nice thick texture. 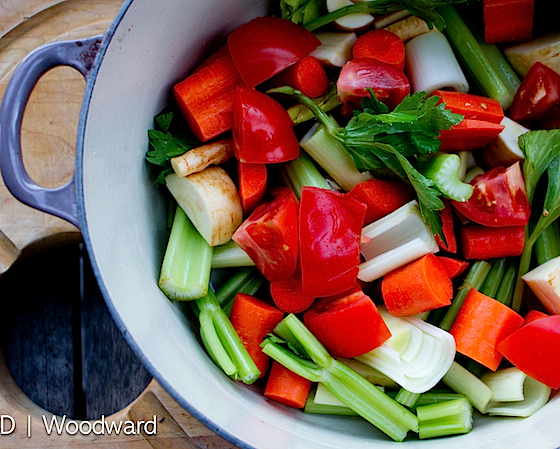 It was the perfect (and flavorful) stock for a big pot of healthy detox soup. In a large dutch oven combine all of the veggies, toss to mix. Put into the oven and roast, stirring occasionally until lightly golden; about 45 minutes. Watch carefully as all ovens vary in temperature and you do not want to burn your veggies. Remove from the oven, let cool for about 10 minutes. Put on the stove top and add the water to the pot, bring to a low boil and lower heat. Continue to cook for 2 hours over very low heat. Remove from heat and let cool for about 15 minutes. Strain into another large bowl. Using a wooden spoon, push the veggies against the colander, to extract as much of the flavor of the veggies as possible. If you would like a thicker stock, put about a cup of the stock into a blender with a few of the carrot pieces; blend and then mix back into the stock. At this point, you can freeze in small portions or use in your favorite soup recipe. 4 Responses to "Homemade Roasted Vegetable Stock"
Love the idea of roasting the veg for the stock to give it more depth of flavour, & will try this one next time I am making stock.